U.S. Transfers Two Guantanamo Detainees To Saudi Arabia : The Two-Way The move marked a small move toward President Obama's stated interest in closing the prison. The two Saudi men released were never charged with a crime, but the U.S. said they were suspected al-Qaida members. A view of the the U.S. 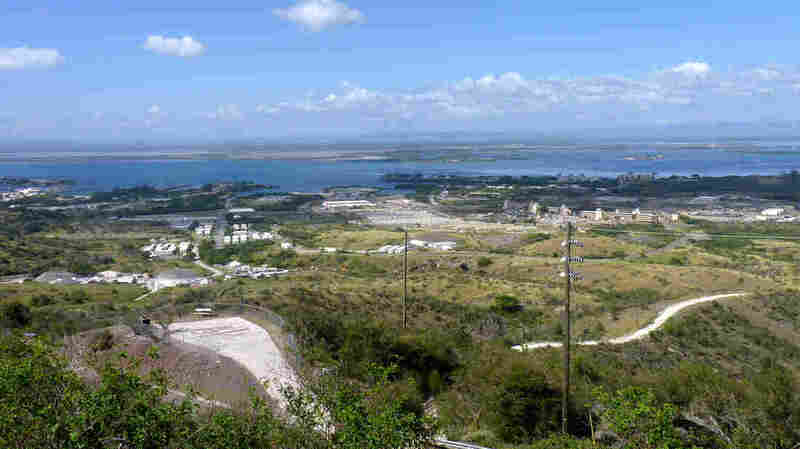 Naval Station base in Guantanamo Bay, Cuba. Guards and prisoners fought Saturday as inmates were moved into individual cells instead of communal housing. Over the weekend, the United States transferred custody of two detainees from its prison in Guantanamo Bay, Cuba, to the government of Saudi Arabia, the Department of Defense said in a press release on Monday. The move marked a small step toward President Obama's stated interest in closing the prison. "In keeping with the charge the President has given us, Cliff Sloan and I are committed will continue to work hard ... facilitating additional responsible transfers to the maximum extent possible as we work to reduce the detainee population and ultimately close the facility," Paul Lewis, the Pentagon's special envoy for the closure of Guantanamo, said in a statement. The Miami Herald's Carol Rosenberg, who covers the prison, reports that there are still 160 detainees in the compound. More than 80 of those, reports The Washington Post, have already been approved for release, but the administration says it has been unable to find countries willing to take them. Rosenberg spoke to NPR Weekend Edition on Sunday to explain the situation. Essentially, Rosenberg said, the U.S. wants assurances that countries taking the prisoners will keep an eye on them. There are, for example, more than 50 detainees at Guantanamo from Yemen. "This administration and the last administration have been very concerned that if you send them back to Yemen — bad economy, unstable country — they're going to be drawn to al-Qaida again, if they were before, or anew if they were, you know, wrong-place-wrong-time prisoners, and that they're going to become a problem," Rosenberg said. Saad Muhammad Husayn Qahtani and Hamood Abdulla Hamood, the two detainees released over the weekend, are from Saudi Arabia. The AP adds: "Neither man had been charged with a crime. U.S. records show both were suspected members of al-Qaida and were considered to be at high risk of rejoining the terror group if released. Dozens of prisoners have been transferred to Saudi Arabia and later released after going through a rehabilitation program." It's worth noting that the situation in Guantanamo has been dire lately. At one point, sparked by what prisoners interpreted as a rough handling of copies of the Quran, about half of the prisoners were on hunger strike. More than a dozen were being force fed.